It's hard not to be smitten with dcoybrand upon first glance. They craft incredible men's items from handwoven, vintage deadstock fabrics and only make as many pieces as each found fabric will allow. 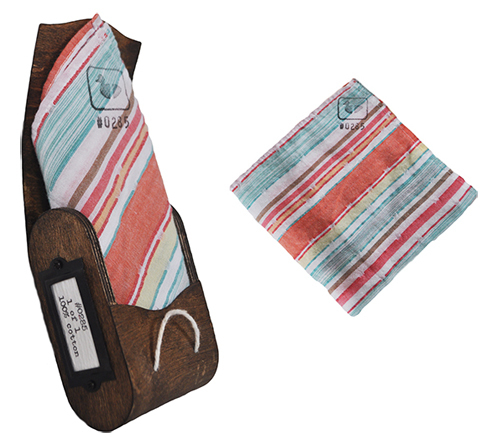 Some are even one of a kind, like this multi-striped linen pocket square. Based in New Orleans, Louisiana, dcoybrand was created by Hunter Monsour. Hunter found inspiration from his grandfather, Horace, who had a love of repurposing materials and sewing his own clothes to ensure nothing went to waste. Hunter offers pocket squares, bow ties and neckties for men (as well as a few items for gals and tots). Each men's piece is stamped with the dcoybrand logo and packaged beautifully in a natural wood carrying case. You'll also find a small card insert that tells you how many pieces were made from a particular vintage fabric.